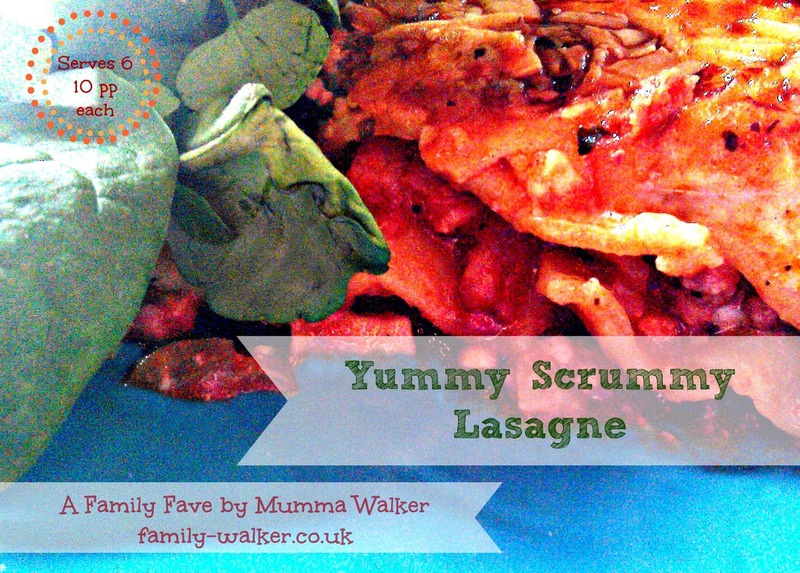 The kids all but do somersaults when I tell them it's lasagne for dinner! It is a bit of an indulgent recipe when I'm on Weight Watchers so we serve it with a salad. If me and the Hubby are not trying to lose weight we split it 4 ways instead for 15pp because it's so tasty and add a chunk of garlic bread! The smoky bacon adds an extra depth to the meal which is simply awesome! The meat sauce is very simple, gently fry the onions and peppers in the oil until soft. Then add the bacon. After a few minutes add the mince and brown. Keeping the heat medium to low add the courgette and mushrooms and stir. Once all the vegetables are softned and the meat is looking cooked add the tomatoes, stock and herbs. Bring to the boil and then simmer uncovered, stirring occasionally. Season to taste. Leave this to reduce until the sauce is think. In a small saucepan sift the flour and nutmeg together and the slowly add the milk, whisking the whole time. Then heat slowly, continuing to whisk, until the milk starts to thicken. Sprinkle in half the cheese and whisk until smooth. Spoon 2/3 of the meat into a lasagna dish / rectangluar oven proof dish. Layer on 3 of the lasagne sheets. Then spoon on the remaining meat sauce and half of the cheese sauce. Place the last layer of pasta, and pour over the rest of the cheese sauce. Use the back of a spoon to spread the sauce over the pasta and make sure it is all covered. Sprinkle over the rest of the cheese.